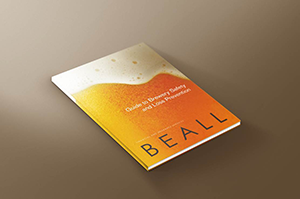 Craft Brewery Insurance Coverages - Beall Brewery Ins. At the heart of the craft beer movement is a desire to create–and to innovate. Craft beer brewers are skilled artisans balancing experimentation with excellence, creating new styles and crafting fresh recipes while delicately maintaining the links to beer’s historic past. Your business is a child of your creativity, and as such, it demands the best protection. The Beall Craft Brewers Advantage offers the best craft brewery insurance available, covering the many risks and exposures that craft brewers face. The craft brewery insurance marketplace is a crowded one, yet it is often difficult to get reliable information that allows you to make informed decisions affecting your craft brewery’s future. When you work with Beall Brewery Insurance, you can feel confident that we provide you with the facts, knowledge, and craft brewery insurance insight that will allow you to plan for your brewery’s growth, and secure your brewery against the many types of risk you may face. We don’t just offer insurance products: we offer you peace of mind. Beall Brewery Insurance companies are financially strong with “A” (Excellent) ratings from A.M. Best. Our full range of coverages can be tailored to meet your brewery’s unique needs and risk exposures.